Figure 6 Schematic presentation of a surface and a ¿w/fc-eroding drug delivery system. 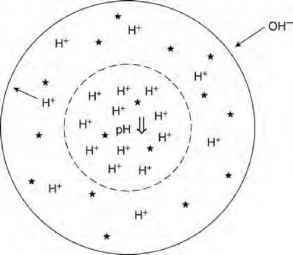 Stars represent dissolved (individual) drug molecules, whereas black circles represent undissolved drug excess (e.g., crystals and/or amorphous aggregates). Generally, polymers containing very reactive functional groups in their backbone degrade rapidly and show surface erosion, whereas polymers containing less reactive functional groups tend to be bulk eroding. Polyanhydrides are examples for predominantly surface-eroding polymers, while poly(lactic acid) (PLA) and poly(lacticco-glycolic acid) (PLGA) are examples for predominantly bulk-eroding materials. However, it has to be kept in mind that the absolute polymer degradation rate alone not only determines the type of erosion (surface or bulk), but also the ratio "rate of polymer chain cleavage:rate of water penetration." The rate at which water enters the system strongly depends on the device dimensions. Thus, in extreme cases, drug delivery systems based on polymers with very reactive functional groups might show bulk erosion, for example, nanoparticles consisting of polyanhydrides. In contrast, devices based on polymers, which generally show bulk erosion, can exhibit surface erosion if they are large enough. Von Burkersroda et al. (42) proposed a polymer-specific, critical device dimension (Lcritical), above which the drug delivery system undergoes primarily surface erosion, and below which bulk erosion. For example, the ¿critical value is in the order of 100 |im for polyanhydrides, and in the order of 10 cm for PLGA. However, it has to be kept in mind that in the vicinity of the ¿critical values, both surface as well as bulk erosion are of importance and the overall erosion behavior of the system shows characteristics of both types of erosion. Interesting mathematical theories have been proposed to quantify the involved physical and chemical phenomena in surface- (43) and ¿«/¿-eroding (38,40,44,45) drug delivery systems. As polymer chain cleavage is a random process, Monte Carlo simulations can effectively be used to simulate this phenomenon. The first to combine such Monte Carlo simulations with diffusional mass transport (based on Fick's second law) was A. Goepferich (46,47). This type of theories can, for instance, be applied to quantify drug release from PLGA-based microparticles (48,49). The basic idea is to divide a spherical microparticle into concentric rings of equal volume. One-quarter of a cross section of such a sphere is illustrated in Figure 7A. As it can be seen, a grid is used to divide this cross section into pixels. If this grid rotates around the z-axis, it describes half a sphere. If the drug and polymer are homogeneously distributed throughout the microparticles, there is a symmetry plane at r = 0, allowing for the calculation of the mass transport phenomena in the entire system. 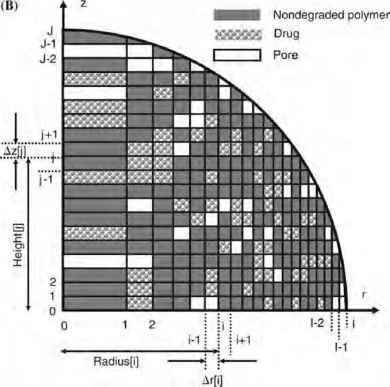 Each pixel shown in Figure 7A represents either drug or nondegraded polymer. This is the situation before exposure to the release medium (t = 0). Upon rotation around the z-axis, each pixel describes a ring. Importantly, the size of the two-dimensional pixels is not uniform and chosen in such as way that the volume of all three-dimensional rings is equal. This assures that the number of cleavable polymer backbone bonds in a ring representing nondegraded polymer is similar in all rings. Thus, the probability at which such a ring degrades upon first contact with water is similar. Since it is not possible to predict that at which time point which polymer backbone bond is cleaved, and as this process is random, Monte Carlo simulations can be used to describe this phenomenon. The idea is to randomly distribute "lifetime expectancies" to all pixels representing nondegraded polymer at t = 0. As soon as a particular pixel comes into contact with water, its "lifetime" starts to decrease. Once the latter expires, the pixel is assumed to be instantaneously transformed into a water-filled pore. Thus, the inner structure of the microparticles can be calculated at any time point (Fig. 7B). This information is crucial for the quantitative description of the resulting drug diffusion out of the system: The knowledge of the time- and position-dependent porosity of the device allows for the calculation of the time- and position-dependent drug-diffusion coefficients. Using Fick's second law of diffusion (22) and considering the given initial and boundary conditions, the resulting drug-release kinetics can be quantified and effects of processing and formulation parameters theoretically predicted (48,49). Figure 7 Principle of a Monte Carlo-based approach to mathematically model polymer degradation and drug diffusion in PLGA-based microparticles. Scheme of the inner structure of the system (one-quarter of a spherical cross section): (A) at time t = 0 (before exposure to the release medium); and (B) during drug release. Gray, dotted, and white pixels represent nondegraded polymer, drug and pores, respectively. Source: From Ref. 48. Figure 8 Scheme of a bulk-eroding PLGA-based microparticle exhibiting autocatalysis: Upon hydrolytic ester bond cleavage, generated shorter-chain acids diffuse out of the system, while bases from the surrounding bulk fluid diffuse in. As the relative acid-neutralization rate exceeds the acid-generation rate, the microenvironmental pH within the system drops (this is often most pronounced at the center of the microparticle because of the longer diffusion pathways). As hydrolytic ester bond cleavage is catalyzed by protons, this leads to accelerated polymer degradation (autocatalysis) and potentially to drug degradation. The stars represent drug molecules. function of the device dimensions and mobility of the involved acids and bases, the system size and initial porosity strongly affect the extent in local acidification. Figure 9 Treatment of operable brain tumors with BCNU-loaded, p(CPP:SA)-based wafers. (A) Schematic cross sections through a brain: The tumor is illustrated as a black circle; the surrounding tissue is infiltrated by cancer cells. Upon tumor resection, up to eight drug-loaded wafers (cylindrical disks) are placed into the resection cavity to minimize the risk of local tumor recurrence. (B) Overall survival of 222 patients with recurrent brain tumors (phase III clinical trial, after adjustment for prognostic factors). (C) Overall survival of 240 patients with newly diagnosed brain tumors (phase HI clinical trial, including results from the long-term follow-up). Abbreviation: ITT, intent-to-treat. 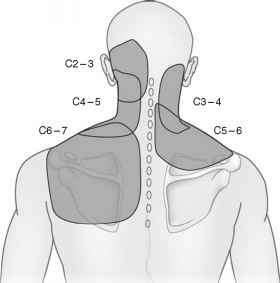 Source: From Refs. 58 and 63 (B and C). reduced. 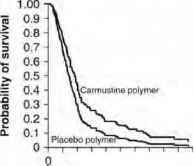 In 1995, a multicentered, randomized, double-blinded, and placebo-controlled phase m clinical trial was conducted with 222 patients with recurrent malignant brain tumors (58). Importantly, the median survival time of the group of 110 patients who were treated with drug-loaded wafers was 31 weeks compared to only 23 weeks in the case of the 112 patients who received placebo disks. Figure 9B shows the overall survival of the patients (after adjustment for the examined prognostic factors). Furthermore, there were no clinically important side effects caused by the BCNU-loaded, p(CPP:SA)-based disks—neither locally within the brain, nor systemically. Later on, Gliadel was also used for the initial treatment of malignant gliomas (59,62). Upon surgical tumor resection, 240 patients received either BCNU-loaded or drug-free wafers. Both groups were postoperatively treated with external beam radiation. The median survival time in the intent-to-treat (ITT) group was 13.9 months for the Gliadel-treated patients and 11.6 months for the placebo group. The one-year survival rates were 59.2% and 49.6%, respectively. A long-term follow-up of this phase m clinical trial with 59 patients showed that 11 were alive at 56 months: 9 of them had been treated with Gliadel and only 2 with placebo wafers (63). 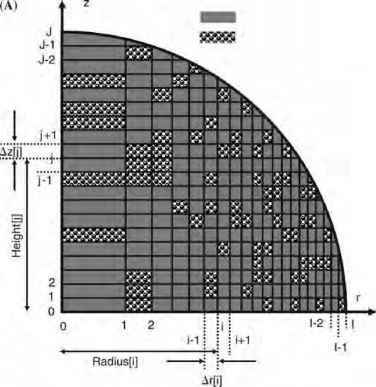 The extended Kaplan-Meier curves for all 240 patients are shown in Figure 9C. 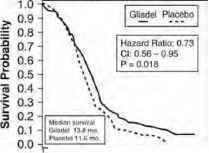 Clearly, the survival advantage of the Gliadel-treated group was maintained even after one, two, and three years. -Cell support (or culture -PAM degrade first from the inside After complete degradation ol PAM. Figure 10 PAM used to improve the efficacy of cell therapies: (A) Schematic illustration of the principle of the approach. (B and C) Optical and scanning electron micrographs of cells adhering onto PAM. Abbreviations'. GF, growth factor and/or cytokine; PAM, pharmacologically active microcarriers. Source: From Ref. 65.
for example, favor angiogenesis or local immunodepression. Upon complete microparticle degradation, the cells can integrate the parenchyma. Recently, nerve growth factor-releasing PAM conveying PC 12 cells were transplanted into "Parkinsonian rats" (64). The idea is as follows: When PC12 cells expressing tyrosine hydroxylase (TH) are exposed to nerve growth factor, they stop cell division, extend long neuritis, become excitable, and after depolarization, can release significant amounts of dopamine (the neurotransmitter that is missing in Parkinson's Disease). Interestingly, first results showed that these nerve growth factor-releasing PAM can indeed reduce cell death and improve the amphetamine-induced rotational behavior of the rats.